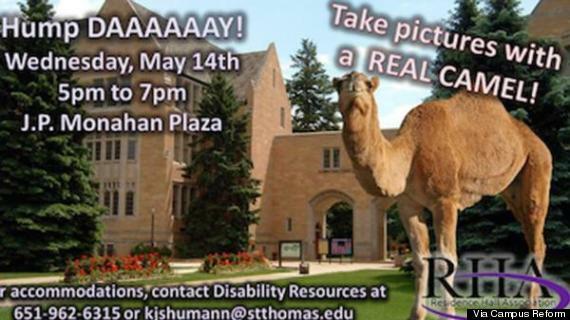 The University of St. Thomas in Minnesota planned to bring a camel to campus to celebrate "hump day," until some students started protesting it online. It was just supposed to be a fun event, not tied to anything besides which day of the week it was, all put on by the Residence Hall Association at the Catholic university. But after a small student protest on Facebook, the University of St. Thomas canceled the event. The original plan was to bring the camel to the St. Paul campus May 14 and turn the quad into “a petting zoo type of atmosphere,” [RHA Adviser Aaron] Macke said. The camel, he noted, is trained for events like these and owned by a local vendor. Some students felt using a camel, which is also associated with traveling through the desert in Africa and the Middle East, would be racially insensitive. "I respectfully disagree," senior Ryan Nolan told TommieMedia. "A camel does not ‘degrade or simplify’ our view of Middle Eastern culture. That would be like saying that turkeys simplify people’s view of America. People wanted to see the camel because it looks cool and because of a pop-culture reference in no way relating to Middle Eastern culture." Sure, that’s an important issue that needs attention, and it often is linked with the domestication of animals. But the camel would have been fine on campus. We’re all adults here; it’s not like any students were going to punch it in the hump. Its safety wouldn’t be jeopardized. Even though the protesters succeeded in getting the event canceled, the camel is still going to be used for this exact same kind of event, just elsewhere.